Posted: Fri Apr 12, 2019 7:55 am Post subject: Deere 212 steering gear adj? I need info on adjusting my 212's steering gear box. I have about four inches of play at the rim of the steering wheel. Thanks for any info. Posted: Fri Apr 12, 2019 8:18 am Post subject: Re: Deere 212 steering gear adj? Sometimes the plastic retainers in the ball bearings will fail, or the balls will get rough. The tapered stud, "D", in the RH photo gets two flat spots worn on it by the "worm" over time, making adjustments without binding as the steering wheel is turn impossible. Posted: Fri Apr 12, 2019 11:55 am Post subject: Re: Deere 212 steering gear adj? Thanks very much for posting the instructions! Can the procedure be done with steering column/box still in the tractor? Do other folks know of any short cuts to this job? Posted: Fri Apr 12, 2019 3:07 pm Post subject: Re: Deere 212 steering gear adj? Should be able to do it on the tractor. There is also an adjustment on the bell crank that the tie rods attach too. Loosen the 5/16" bolt, remove the keeper on the bolt, tighten the bolt and reinstall the keeper. Posted: Sat Apr 13, 2019 9:29 am Post subject: Re: Deere 212 steering gear adj? Sounds good. Now waiting on rain to stop. Thanks for the tips. Posted: Sun Apr 14, 2019 7:28 pm Post subject: Re: Deere 212 steering gear adj? The manual is confusing and does things in a roundabout way. I would not unhook anything unless you need to replace tie rod ends. I'd pump the case full of grease through the angled zerk on the top of the case. I'd snug up the end plug like the manual says - tighten until it drags and then back out until you can get a cotter pin through. Then I'd tighten up the big nut that holds the moving plate to the rest of the case. Then I'd try adjusting the tapered pin. If it's badly worn, you won't get a good setting by turning it in - it will go from loose to stuck in a quarter turn. That tapered pin is replaceable, and it makes a lot of things better in there. Posted: Mon Apr 15, 2019 6:03 am Post subject: Re: Deere 212 steering gear adj? Thanks! that makes a lot of sense to me and I should be able to try those steps in next few days. I looked up the tapered pin's part number on internet Deere catalog, my local dealer seems to have one, price about $35.00. If my old part is really worn out, then It just depends how badly I want to get rid of steering wheel play. Thanks for the information! Posted: Mon Apr 15, 2019 7:08 am Post subject: Re: Deere 212 steering gear adj? 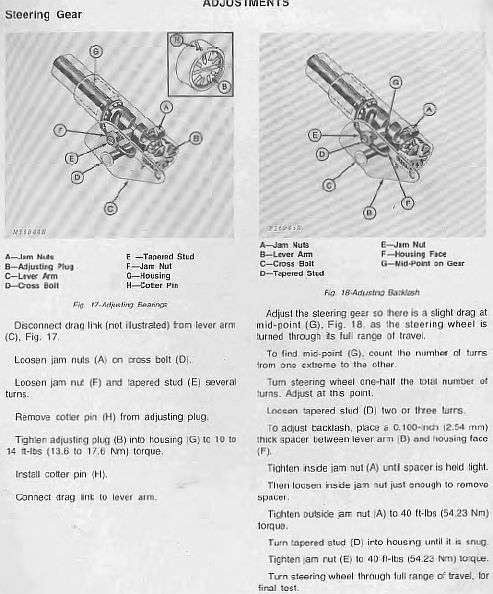 Posted: Wed Apr 17, 2019 11:50 am Post subject: Re: Deere 212 steering gear adj? I worked on it this morning, applied four squirts of grease, the adjusted the lug for least steering wheel play without causing binding anywhere in turning from extreme left to extreme right. Steering feel seems much better now. Thanks to folks' suggestions.